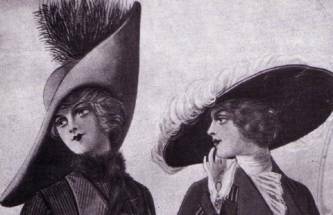 Although the hair of the 1910s was typical concealed by an extremely boisterous hat, the styles are still identifiable beneath the wide brims. Prior to 1913, women's hair was piled high atop the head and thickly padded. 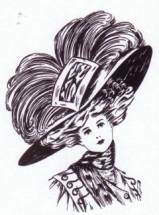 Notice the thick hair beneath the large hat in the image below. After 1913, more natural waves and curls framed the face. Notice the much tamer, more natural look beneath the women�s hats.